As I began creating this post, I realized I've probably done something very similar to this before. Daisies from the grocery store aren't new to me but every day really isn't about something new. Life is really about the little things and some of them happen over and over. Today I'm happy with little bits of daisies and Elvis on Pandora. That's not new for sure! Little bits of daisies in my favorite red polka dotted pitcher along with a cup of half caff coffee. Little bits of daisies and lots of dusting to do. Hi Stacey, just seeing a post like this makes for happy. Pretty daisies! Enjoy the day and dusting ~~~ I'm doing the same here. Well, it certainly made me smile, Stacey! 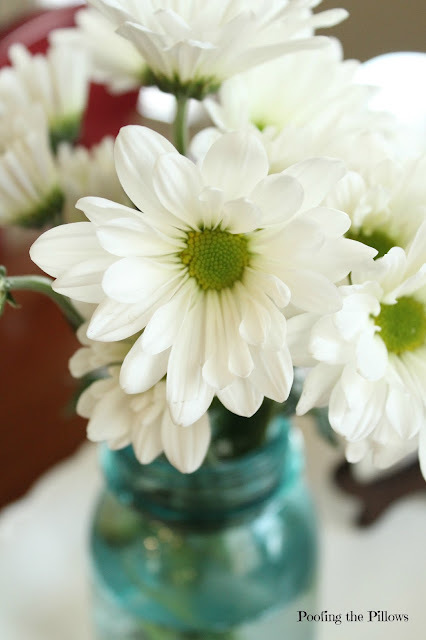 you can't get simpler than daisies, but aren't they so pretty? You are right, it's the every day little things that can make our day! Have a good one! Very true sentiment Stacey and very pretty flowers! Love that polka dotted pitcher! I have that same little red and white polka dot pitcher and I have some white daisies so I might just copy you. Daisies are such a happy flower. They look great in your polka dot vase! Daisies, Elvis, and coffee--three things that always make me smile! Lovely post, Stacey! Your daisies are really pretty, Stacey! It definitely is the little things that make everyday wonderful. I'm not sure why, but dusting is one of my least favorite chores so it doesn't get done nearly as often as it should! "Life is really about the little things and some of them happen over and over." You are so wise Stacey! Your post gave me a smile today. I love daisies too. It is the little things that makes us the happiest. Thanks for the smile today with your post. Stacy, Stacy! I love daisies and always have! There is nothing sweeter than a pitcher full of daisies! I'm leaving here and I'm smiling away and I'll be off to buy some daises now! I never tire of posts like this. Daisies always lift my spirits. Thanks for the smile this evening. How can daisies and Elvis not make you happy? Thanks for stopping by my blog. 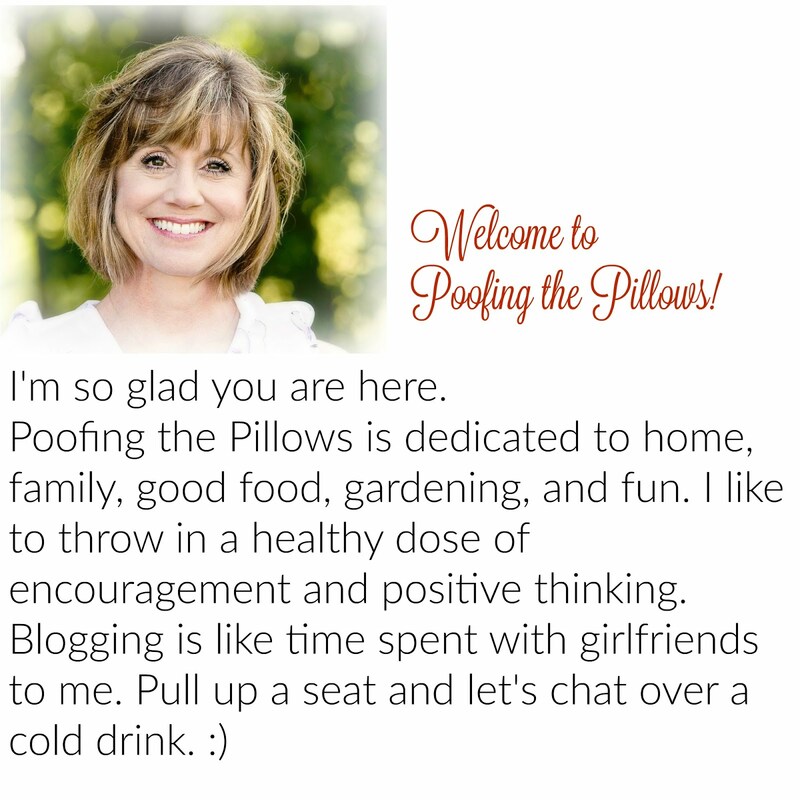 I've really missed you and my other bloggy buddies. But it was worth it to focus on Shelley. She's made a lot of progress! Hi Stacey! I loved this post and you're so right. Happiness is not always having something new or doing something new. I believe happiness is those little things, the comfortable things that surround us. Thank you for reminding me of this. I used daisies last weekend in a semi formal graduation party centerpiece. Silver bowl, crystal pics and daisies to keep it "real"! It was a hit! Love you for your "little bits"......and the dust....makes me feel comfortable visiting! Daisies can make me smile in a second, and when I wake to a field full of them, my day is instantly bright and sunny. Your beautiful bouquet, nestled in that pretty red and white polka dotted pitcher is worth repeating! I love Daisies. Yours are so pretty that I'll have to pick some up next time I'm at Kroger. Have a great weekend. I can never get comments to work! Just saying Hi Stacey! Love Daisies...love Elvis... Both simple and timeless. 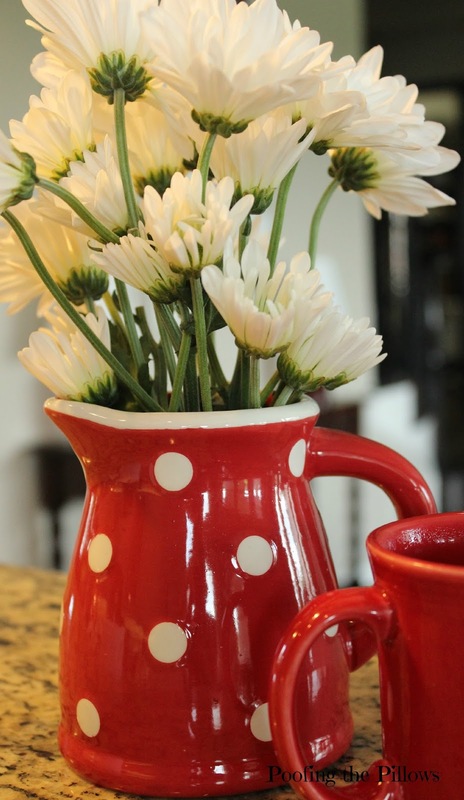 Your daisies look so happy in the red polka dot creamer. Stacey, thanks so much for your comment about the kitchen lamp shade. You nailed it. I responded on my blog but not sure if you will see it. Thanks for stopping by my blog and leaving such a nice comment. 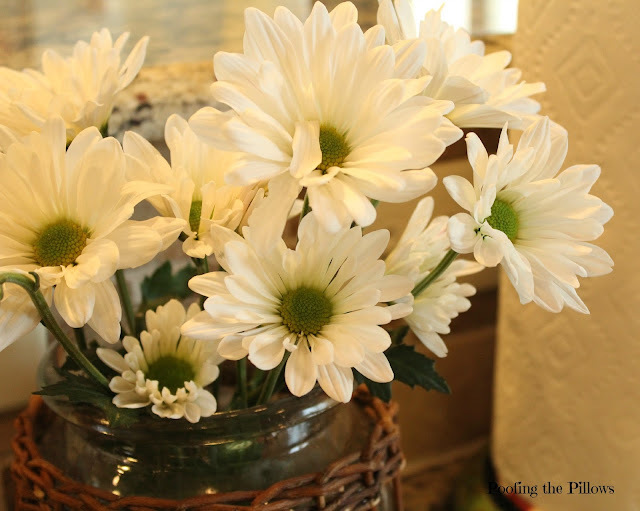 I've hopped over her to check out your blog post and I agree that daisies are a great pick-me-up and add loveliness to your décor. I'm a new follower and will be back soon. Daisies are such happy flowers...I think Meg Ryan says that line in "You've got Mail" and rightfully so! They do brighten up anywhere they are placed. Love your containers too. Thank you, Stacey, for stopping by to sniff the peonies on my blog. It's a treat to visit you for the first time and browse through a few of your cheerful posts. Daisies are sprightly and uplifting, somehow, and I love your turn of phrase, "Little Spots of Happy". I'll be looking for my little spots today. Love daisies!! And it is the little things that make life so special! !